Oats are a rich source of fibre, magnesium, potassium, calcium and protein. 1. Combine the oats, ghee, wheat flour and salt in a large bowl. 2. Gradually add the water and knead well to a pliable chapati dough. 4. Make small balls of the dough and roll them into medium chapati. 5. Heat a tawa over high flame. 6. Cook the prepared chapatis on both sides, adding little oil around the edges. 7. When it is almost cooked, remove and cook them on direct flame on both sides for a few seconds (like a phulka). 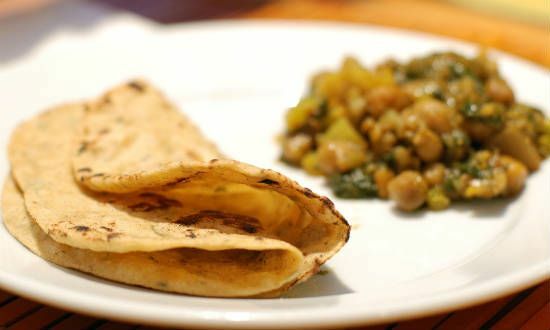 Feel free to comment or share your thoughts on this Oats Chapati Recipe from Awesome Cuisine.